The barn aisle is a handy place to carry out many tasks with your horse. 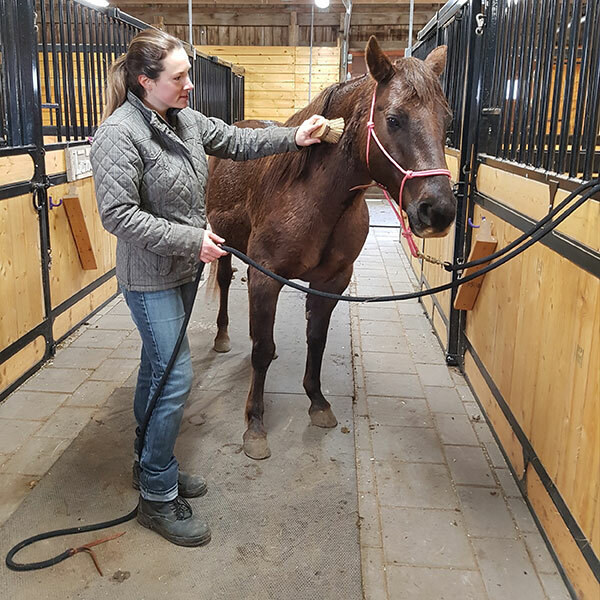 Professionals who visit such as your vet, farrier, chiropractor or massage therapist all appreciate a horse who can stand relaxed in the barn while they work. Most of us also groom and tack up in the barn. Even though spending time in these tight spaces goes against the nature of horses who are instinctively claustrophobic, they can learn to relax and enjoy time in the aisle. 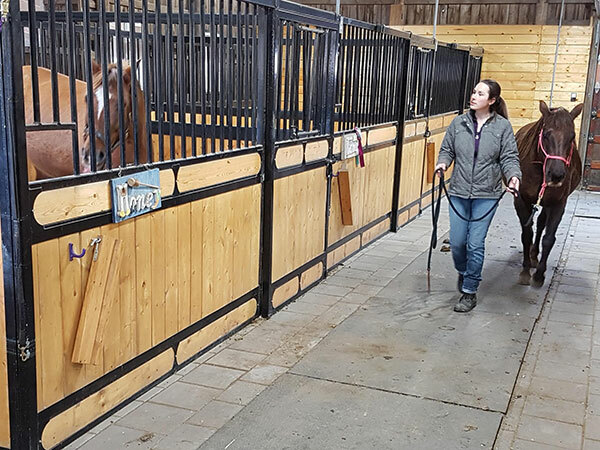 There are two main aspects to barn aisle safety that contribute to a laidback energy in even the busiest of facilities – personal space (part 1), and safe tying practice (part 2). Depending on the time of day you choose to work in the barn, there may be horses in stalls lining the aisle. Some of these horses are protective of their stalls, while others are just concerned about the claustrophobic space. They cannot create more distance for themselves than the back wall of their stall permits. Sometimes these horses become uncomfortable, showing signs of stress or aggression as you pass with your horse. Do these horses a favour and ask your own horse to walk along the opposite side of the aisle to respect their space. The stalled horse can feel less tension with your consideration of their personal space as you walk past them with your horse thoughtfully, and your own horse will also appreciate being led by a socially savvy handler. Horses who are being led past your horse while you are working in the aisle also need personal space. Even if you have the friendliest horse around, the safest option is to ask your horse to move over to one side while another horse passes. Untying your horse ensures you will have the opportunity to stay clear of passing horses, meanwhile keeping your own horse’s attention on you. A relaxed horse is much safer to have in the close proximity of the barn aisle. Consider spending more time hanging out in the aisle scratching his itchy spots or eating his supplements if your horse doesn’t feel good in this space. The idea is to change the routine so that he is not coming into the barn just for health care or work. In part 2, I will introduce a method I use for teaching horses how to tie safely and stand in cross ties. I believe this is a skill every horse should learn, yet not have forced upon them in any way that becomes a fearful or painful lesson.